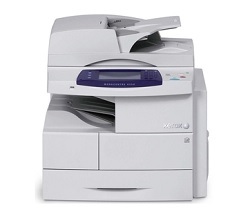 Xerox WorkCentre 4250 is a monochrome laser multifunction printer that is suitable for the medium or large office. Fuji Xerox WorkCentre 4250 has multifunctional office capabilities on top of high-speed monochrome laser printing capabilities. It has an 80GB hard drive as well as 256MB of internal memory, and the optional fax module lets you take the place of the standalone fax machine. Fuji Xerox WorkCentre 4250 is easy to use directly, with a large and bright 7in touchscreen that has a relatively simple interface. You can easily copy, scan and e-mail scanned documents with a clear and understandable icon-based user guide. Fuji Xerox WorkCentre 4250 can be shared through office network via 10 / 100Mbps Ethernet port. A front-mounted USB 2.0 port means direct printing and scans are also possible. We managed to print PDF files, Rich Text and plain text using USB ports but were unable to print Word files. Administrators can set security options to prevent direct printing without a password. Two-sided printing lets you reduce paper usage. This is useful because the standard front-loading document tray can hold only 500 sheets of A4 paper. Large copy jobs are made simple with the combined use of a 100-sheet automatic duplex document feeder and two-sided printing mode of the printer. If you plan to do serious printing, you need an optional 500-sheet optional tray or a 2,000-sheet feeder, or optional dummy to arrange and stack documents. Download the Xerox WorkCentre 4250 driver according to the Operating System on your PC or laptop at the link below.